Wash mutton in tap water 3 to 4 times without any impurities. Add a generous pinch of turmeric powder, mix well and rinse with plain water for 2 times. Grind coconut, fennel seeds and roasted gram with enough water to a smooth paste. Keep it aside to use later. Heat a pressure cooker or strong bottomed kadai to cook chicken, add oil once it gets heated, add 1 tbsp of ginger garlic paste, 2 tbsp of chopped small onions and few curry leaves. Saute well and add washed mutton pieces. Stir for a second, add some water and salt. Close with a lid and pressure cook for 4 to 5 whistles. Check the mutton pieces are cooked after the pressure completely released in a pressure cooker. The red meat must be tender and soft. Separate the mutton stock and pieces. Use mutton stock for making rasam or gravy. To make Chukka, heat a kadai, add 2 tbsp of oil, once the oil gets heated, season with bay leaf, cinnamon, cloves, cardamom and curry leaves. Add chopped onion and saute well until it turns pink in color. Now add remaining ginger garlic paste, saute till the raw smell goes off. Add chopped tomatoes to it, sprinkle some salt and cook well. Once it gets cooked, add turmeric powder, red chili powder, and coriander powder. Mix well and then add grounded coconut paste. Mix well, add a little water to it. Once it starts boiling, add cooked mutton pieces, close with a lid and cook till the water gets absorbed completely. Keep the flame low, stir occasionally to avoid burning at the bottom. Add excess oil if needed. Once done, garnish with coriander leaves and turn off the flame. Pressure cooking time of meat depends on the type of meat. If the meat is matured, you have cook for 7 whistles. You can marinate the mutton pieces with 1 tsp of lemon juice, a little salt and 1 Tsp of red chili overnight to have a tender and juicy meat. 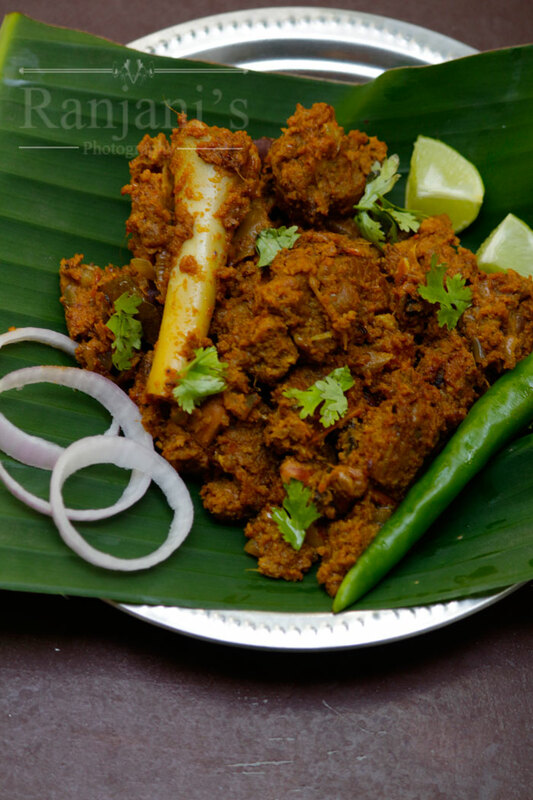 Use small onions and gingelly oil, as it will give an authentic taste of mutton chukka recipe. Adjust salt and spiciness more or less for your taste. Thanks for sharing. I love learning about unique foods. 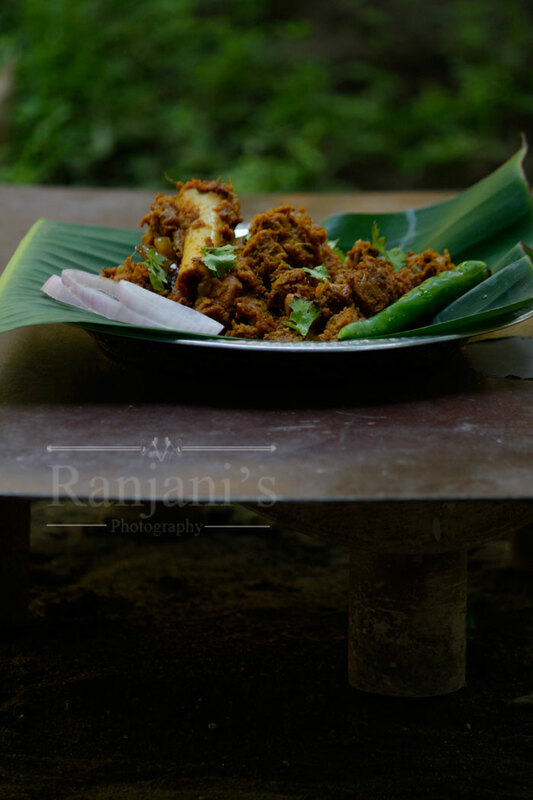 hi ranjani.. im loving this mutton dish. it is definitely a dish worth trying. thanks for sharing.